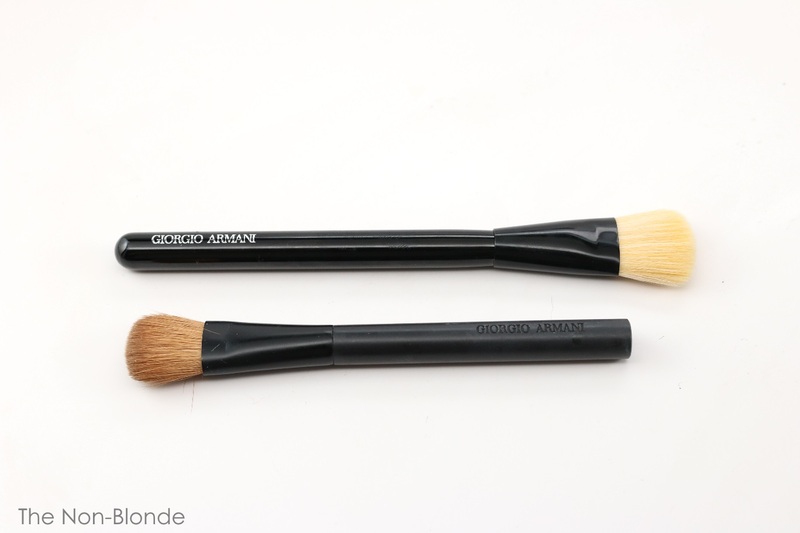 Giorgio Armani Beauty has recently revised and updated the brush collection, as did NARS, YSL, and Dior, to name a few. It's nice to see that makeup companies respond to the growing interest in quality beauty tools, and even more so when they design brushes to work with their particular products. Of course, we are paying a premium for the name and branding, but that has always been the case. Giorgio Armani hasn't been the biggest offender (the honor belongs to Tom Ford and Suqqu), but I have to say that some of the new brushes are definitely getting there. Compare (none of the links are affiliated) the new Armani Maestro Sculpting Powder, $90, to its identical twin, Hakuhodo Fan Brush White, $45. Both are made of 100% white goat hair, so it's not like Armani opted for the more luxurious blend of goat and blue squirrel hair (currently $63). 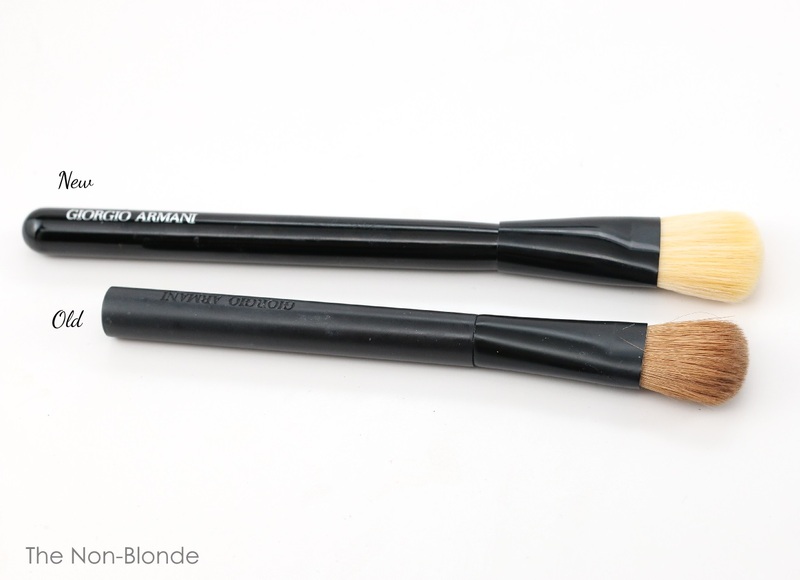 So, what made me buy the new version of Armani's Blender Brush? First was the fact that I've been very fond of the old one. The unusual size and shape have proven to be an excellent choice for tinted moisturizers and very runny liquid foundations. My brush has been in frequent use over the last five and a half years. As you see above, the brush has retained its shape (as well as its snap) perfectly with only slightest loss and broken hairs. However, I suspect that countless washes have made the sable even coarser than it's been (and I use hair conditioner on natural fibers that get washed often). Either the brush has become scratchier, my skin more sensitive, or both. In any case, the new blender brush tempted me from first sight. Armani's new version has a longer handle, but the head is only marginally wider and longer. It's retained the shape and proportions that have made the original blender such a great tool, but the updated one is infinitely softer. 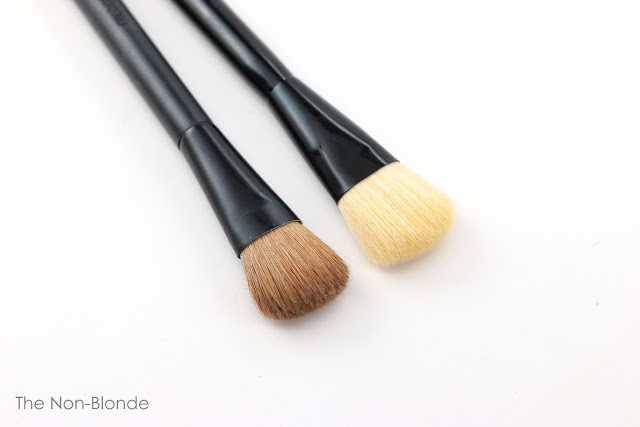 It's 100% synthetic, which is generally a good thing for foundation brushes, except if you're a die-heard devotee of sable for its snap, or hate dealing with the way synthetic fibers tend to stain and the longer cleaning time. While I have no solution to the first issue, I highly recommend using either the Beauty Blender cleanser (bar or liquid), or my favorite: Shea Moisture African Black Soap Bar (my local Ulta carries it, and also widely available online). I also use the Sigma cleaning mat that attaches to the sink with suction cups and acts as a washboard. It shortens the process even more. The new Armani blender is still very good for applying super thin textures without streaking or skipping , thanks to the relatively short but thick bristles. The added heft compensates for most of what the brush has lost from the change of hair, so there hasn't been much of a learning curve. Add the wonderful softness of the new brush and that's a major improvement. The brush still stands out in its shape and performance, and since the superior Hakuhodo G520 (it was a blend of natural weasel and synthetic hair) is no longer available in the US, there's very little else in the exact same category. Is it enough to justify the cost (and space for another brush)? Yes, if you're looking for something that's more luxurious and performs better than a good classic paddle brush and use very thin-textured base products. Is it a must-have? No, not really. But it's really nice to have. Giorgio Armani Blender Blush- New Version ($70) is available from Barneys, Nordstrom, Saks, and Armani USA online. In a moment of not thinking, I threw away the box. According to Saks website the brush is made in France. However, giorgioarmanibeauty-usa.com alludes that the entire range of brushes are made in Japan (though they don't say it clearly). The truth is out there, and I'll most likely have a more definite answer by tomorrow. I tried to comment on this post on the day that it came out but I think my iPad mini has just gone wonky and it never got sent for approval. Anyway, about 4 hours before you published your review, I had just placed an order for the old brush because I had been using my travel size version and realized that I really liked it when using Luminous Silk. Since that's been my go-to foundation this winter, I felt that I needed the full size brush. I hesitated on the new brush with the synthetic bristles and the additional $21 it would cost me. So the new "old brush" arrived just today (had a heck of a time trying to find it and NM seems to be taking forever to fulfill my order). The old brush is made in China and does not seem the same as the travel size one. What gives? The hairs seem totally different from my travel size one although head size and shape seems mostly the same. The hairs seem like they are synthetic! The color is lighter too. I am no brush expert but I was expecting basically the same brush as the travel size one but with a longer handle. I almost thought they sent me the new brush by mistake but the handle looks like the old one. Do you think that with later releases, they changed the brush somehow? And did you ever find out if the new brush is made in Japan or France?